Heathfield was opened in 1969 and is located 13 miles NNW of Eastbourne. The top of the mast is 998ft (302m) from sea level and the total mast height is 145m, though the height to the bottom of the antenna shroud is 135m, see How High is High ? Heathfield`s population coverage is around 500 thousand and it has sixteen (including Hastings) smaller repeaters off it to improve its signal coverage in poor areas. Note how after the switchover in 2012 Heathfield is now a B group (as opposed to its original C/D group). Thus four of the six MUXES are technically out of the original C/D group. 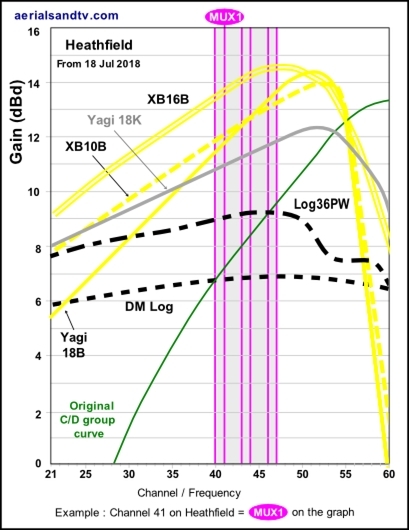 But the graph shows quite clearly that the “cut off” for C/D group aerials is not precipitous and that most people in reasonable signal areas will get all the Digital OK off their “old” C/D group aerial, particularly as the power was increased at DSO by a large margin. Though this may not apply to some cheap crappy Contract aerials. For Heathfield`s frequencies see its channel allocation guide. 700MHz clearance occurred at Heathfield on the 18 Jul 2018 when it stayed a B group. 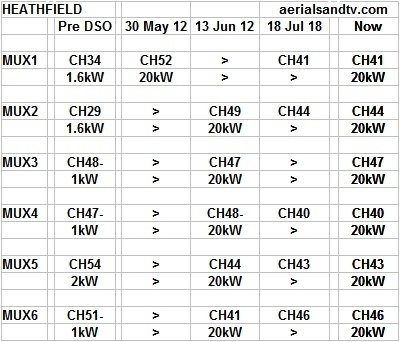 There are no “Local” channels allocated to Heathfield in the latest scheme, but a slight possibility exists of more TV channels being transmitted between CHs 31 and 37. All of these can by picked up be (decent) B or E group aerials. Heathfield is a B group though before switchover it was a C/D group. However, C/D group aerials often pick up signal quite well below their designed for band, reception of all the digital may still be possible on an original "analogue group" aerial (see Heathfield`s graph ). This may not apply to some cheap crappy Contract aerials. In any event the main 3 PSB MUXES will almost certainly be receivable on a C/D group antenna. Being a main transmitter Heathfield is horizontally polarised. Before the switchover all Heathfield`s digital output was attenuated to the south so as not to cause co-channel interference with transmitters in that direction, including those in France. This meant that Eastbourne, being due South of Heathfield, had particular problems with digital reception. However post DSO Heathfield has, for the first time, an omnidirectional transmitter radiation pattern*, thus sites south of the transmitter should have experienced significantly improved reception. For Heathfield we recommend the DM log for strong signal areas, the Log36 for medium signal areas, the Yagi18B for outdoor installs in poor signal areas, the XB10B for loft installations in poor signal areas, and the XB16B for those with the most marginal signals. Unless you have a massive loft we`d normally recommend an XB10B for loft installs (over an XB16) due to smaller size of the former aerial. The dimensions and test performance of the aerials can be found on the relevant tables. The channel allocation guide below also includes the same information for other potentially co-receiveable transmitters, this also include the frequencies for Crystal Palace, Bluebell Hill, Tunbridge Wells, Dover, Hastings, Whitehawk Hill (Brighton), Rowridge, Midhurst, Guildford and Reigate. This data can be very useful for identifying other transmitter options, see importance of "line of sight". The channel allocation guides can also be very useful in the diagnosis of co-channel interference problems and can also be invaluable if you are trying to find a spare channel for a modulated output (e.g. for a Sky box or CCTV system) to be added to your TV setup/distribution system without suffering from co-channel. 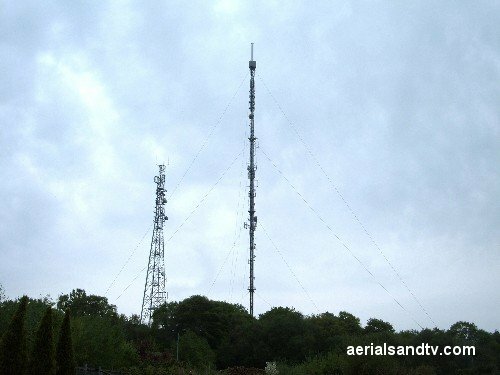 For the most up to date MUX to channel allocations see Digital UK Heathfield transmitter. Note the big increase in power after the 2012 digital switchover. Note the various co-channel issues, and that`s before one brings in the continental transmitters ! Also check Heathfield`s sixteen (including Hastings) smaller repeaters .